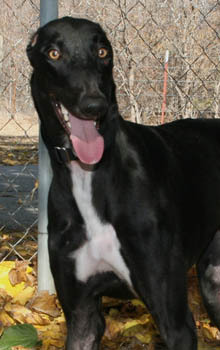 Panther is a 2-year-old black male born in 2010. 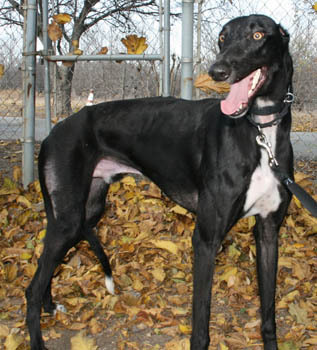 He is not tattooed, but was obtained by his former owner from a breeder as a puppy - his owner lovingly nursed him through parvo as a puppy, but was no longer able to keep him so he has joined the GALT family. Panther and Madison are littermates. While Panther passed an initial cat test, living with them has just made him more and more interested in chasing them. No cats for Panther, please. He has lived peacefully with a smaller dog before. Panther is a sweet boy who always wants to be loved on. 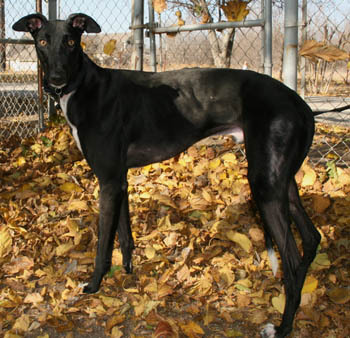 He is energetic and could make a decent jogging partner. He went for a mile run with us and barely had to trot to keep up thanks to his long legs. He likes to play with stuffed toys and doesn't tear them up and he is food motivated to boot!